Withstanding temperatures up to 210 degrees Fahrenheit, this Cambro 1013CW486 Camwear® Camcover® plate cover is perfect for meal service in heated carts. It is designed to keep heat or cold air around the food while keeping contaminants out. Since it is made of polycarbonate, the cover is heavy duty and corrosion resistant. This material is lightweight, so it does not make a lot of noise during service. 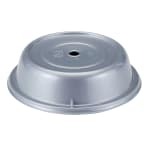 With its silver color, the Cambro 1013CW486 Camwear Camcover plate cover has the appearance of metal.